Oh boy, its Super Bowl Sunday (not that I care) and a storm is coming! Rain is exciting during this terrible drought in California. I have never been as excited about a little rainfall in my life. I think the storm total for Huntington Beach from this storm was 1/4 inch, but we really, really needed the rain. My rain barrels were EMPTY, unprecedented for January. 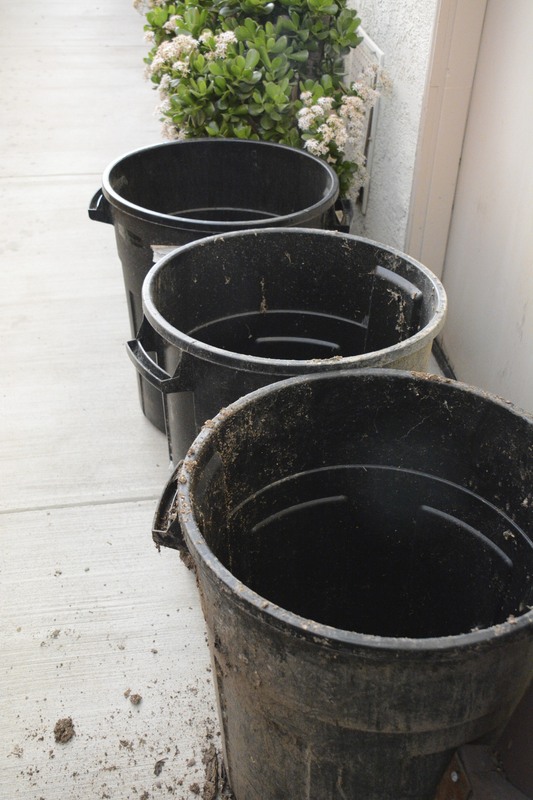 In anticipation of this “storm”, I set out all of my Rubbermaid 20-gallon trash barrels to collect runoff from the non-guttered portion of the eaves. The tiny amount of water in the bottom of this container was from a mere mist. And yet I got measurable water in the bottom, because I set the containers under the eaves to capture runoff from the roof. Here are three containers in a row, positioned to catch the maximum amount of water dripping from the eaves. There are two other barrels farther down the row of jade plants. Note that I didn’t waste water to wash off the containers, which are stored next to the chicken coop during the dry season. The quarter of an inch of rain that fell last night resulted in about 4-5 inches of water in these barrels. 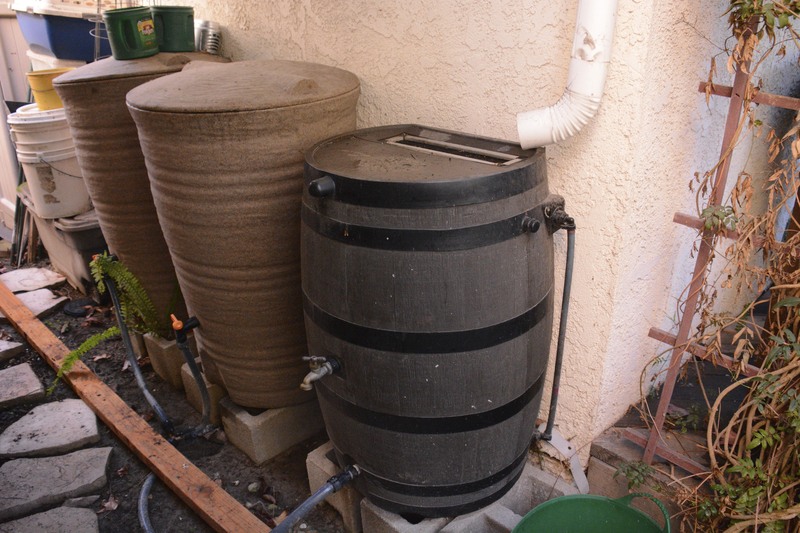 This rain barrel in front holds 50 gallons. 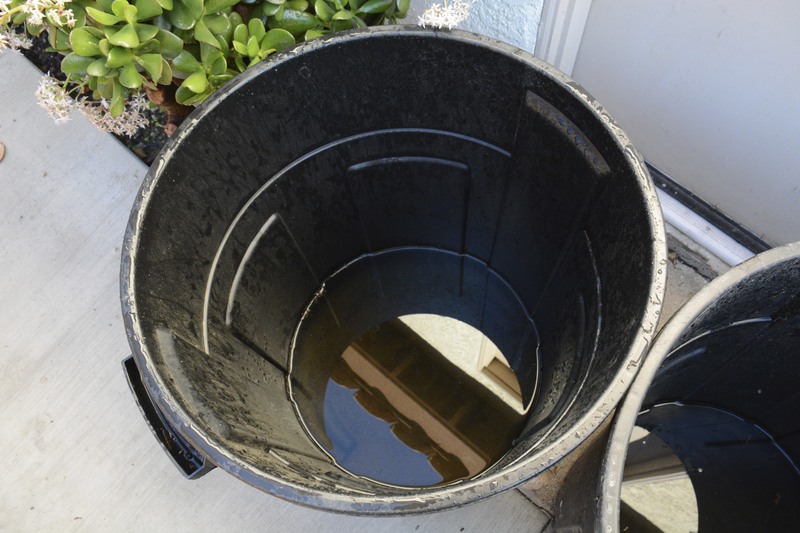 However, it collects directly from roof runoff, not from a gutter, and so it got about the same amount as the Rubbermaid trash containers, 4-5 inches. This is where the bulk of our rainwater collection occurs. We have one rain barrel set up under a gutter. The other two barrels are linked in series to it through tubing. These 50 gallon barrels are 2/3 full! 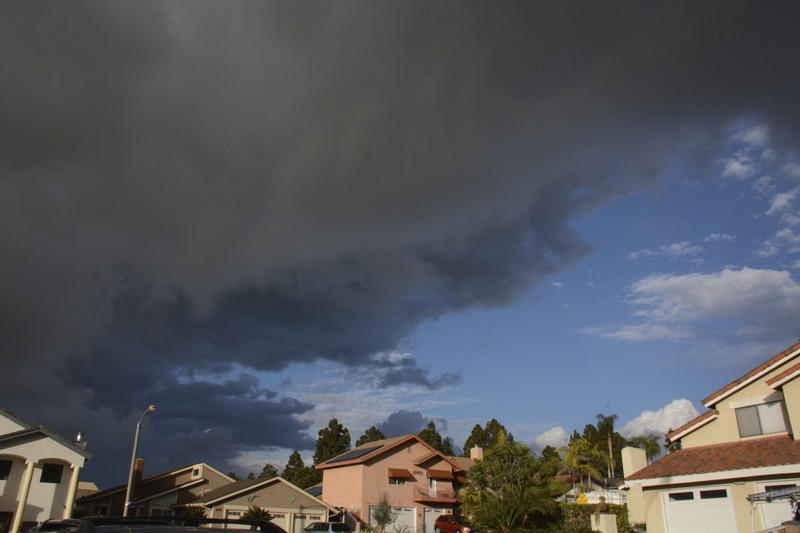 From just one storm that produced only a quarter of an inch of rain. Amazing. So does this type of water conservation help? You bet. Over our southern California rainy season from September to April, I use that rain water to water my garden in between storms. Over the wet season, I may empty the barrels several times, and they refill during the next storm. I have four 50-gallon rain barrels, and seven 20-gallon Rubbermaid trash containers that I put away when the wet season ends. That is a total capacity of 540 gallons, times however many times I can empty and fill them during the wet season. That certainly isn’t the only water conservation measure that Vic and I use. We have two low-flow (1.6 gallons per flush) toilets, a Toto and a Kohler. Now that California is in a drought crisis, “we don’t flush for number one in this land of fun and sun.” “If it’s yellow, it’s mellow. But if it’s brown, flush it down.” I know, TMI. Our water-saving measures do really work. We get a water bill from the City of Huntington Beach that shows our water usage over the past two year period in a graph. I did some calculations and found that our two-person household used 5.6 units of water per month for 2013. A unit is 760 gallons, so that works out to 69 gallons per person per day. Average in California is 150 gallons person per day. For 2012, we got more rainfall and I didn’t need to water the garden as much. For that year, we used an average of 4.3 units per month, or 54 gallons per person per day. That is 1/3 the California average. And yet we manage to grow about 250 lbs of fruits and vegetables a year. How do we do it? Our washing machine has different settings for various size loads, and we use only the amount of water needed for a particular load. We don’t let the water run when we brush our teeth. And we don’t waste water letting it run to get hot when just washing our hands. The cold tap will do just fine. We have friends who are collecting water from their showers, and using that to water plants outside. 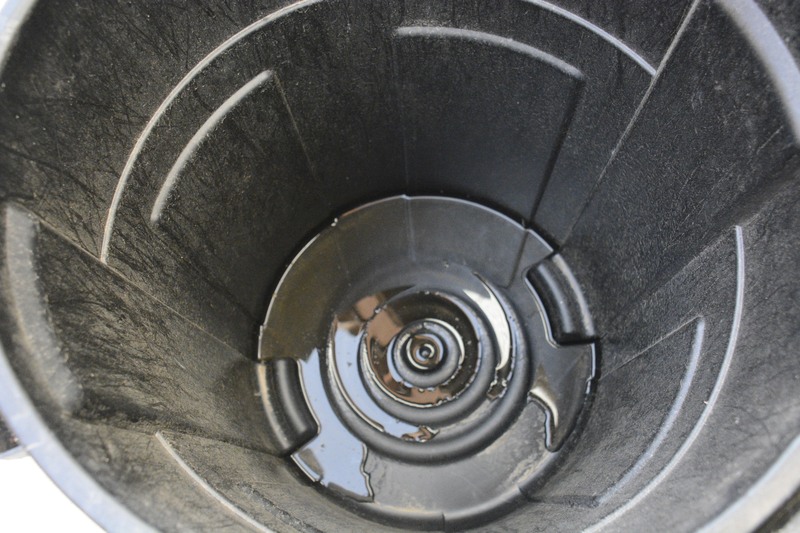 We know other people who move the outlet hose from their washing machine from the drain to a large container to collect the rinse water from the laundry. 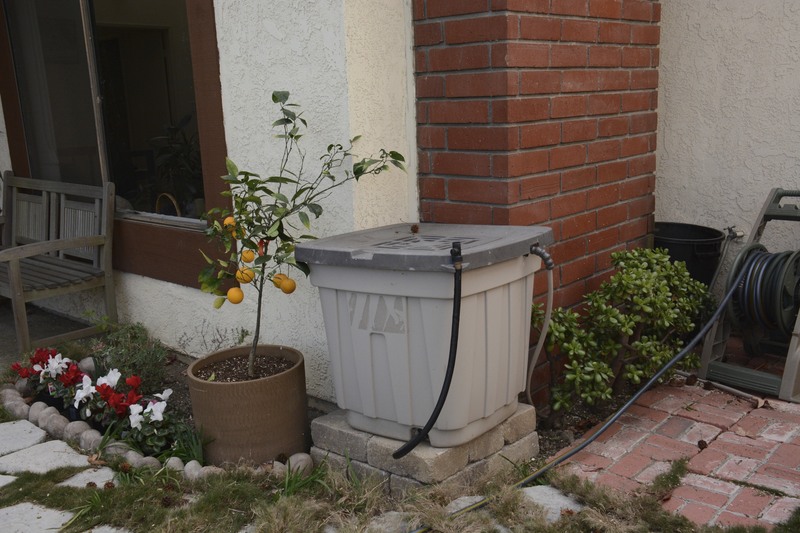 Another water-saving strategy is to keep buckets by the sink and shower to collect the tap water as it runs to get hot. Or you could invest in a hot water circulating system so there is always hot water on demand. The Orange County Waste Management District does their share too. We have a “toilet to tap” program of purifying sewage water to better than tertiary treatment with reverse osmosis, and then pumping that water back up river to percolate down through the Pleistocene alluvium that underlies the Santa Ana River. Consequently, we are not yet hurting for water in Huntington Beach. But Vic and I practice conservation because we want to, and to set a good example. There are something like 18 million people in the greater Los Angeles area, of which we are a part. There just isn’t enough water in Central and Southern California to waste when it has to cover such a huge population. I expect everything to grow like gang busters now that we have had some rainfall. This is my herb garden, with three veggie beds beyond. Fruit trees border the yard. With luck, this will be a link to my post in January 2010 when I first set up my rain barrels. Are you in a normally low rainfall area? Is your area in a drought crisis? How do you save water? 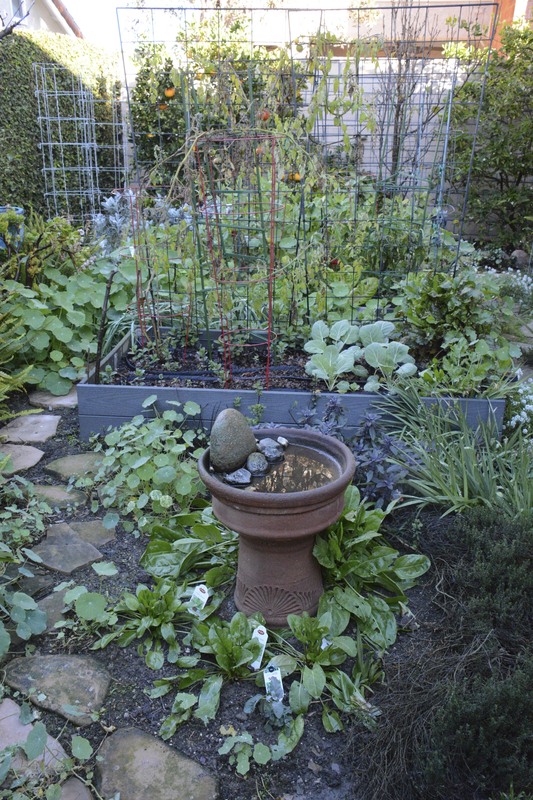 This entry was posted in Uncategorized and tagged California, drought, Huntington Beach Community Garden, Rain barrels, saving water, southern California, tips, water conservation, water harvesting. Bookmark the permalink. 6 Responses to We got RAIN! And I saved it. GOOD for you, Louann!! We did not get that much rain in Inland So. Cal. And, as if drought is not enough of a problem, my internet home page and e-mail are also down, although the web is still accessible. Go figure! Hey, Laura, we have another chance at rain tomorrow. We really do need to get up to date on the water usage at our house. There is a forecast of 100% chance of rain on Friday. I’m excited.